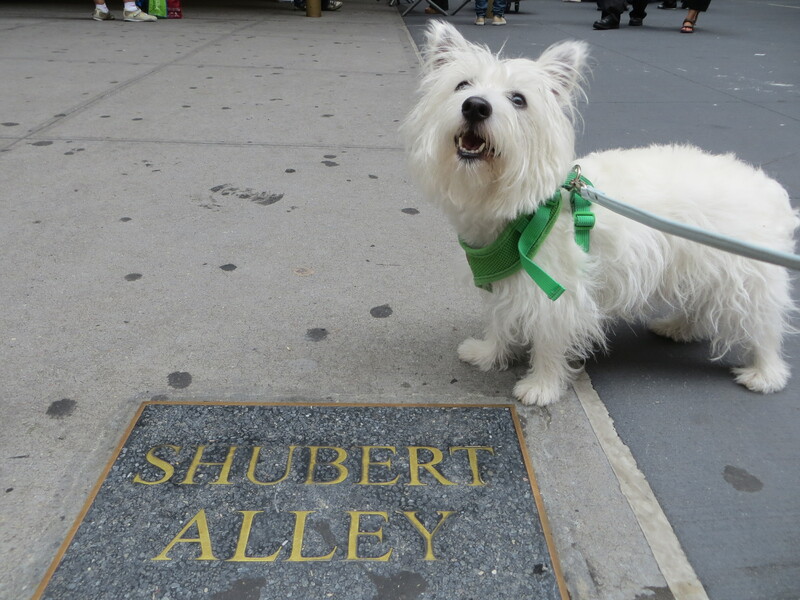 We headed to Shubert Alley Saturday afternoon to check out the 15th annual Broadway Barks pet adoption event. We went early because it was hot outside and the event tends to get very crowded with people looking to adopt animals and meet Broadway stars. Founded by Bernadette Peters and Mary Tyler Moore, Broadway Barks has seen hundreds of animals find forever homes through this annual event. Animal shelters and rescue groups from the Mayor’s Alliance for NYC’s Animals line the Alley and part of 45th Street with adoption information tables and adoptable animals. Mom was approached several times to see if we were available for adoption. Nope! But we both did have similar starts as shelter pups looking for homes! We wanted to spend the afternoon at the Stella & Chewy’s table looking for treats! On Sunday, while shopping for dinner at our local pet shop, we met a doggy who had been adopted the day before at the event. He was so cute and had a sad story with a happy ending. Someone had left him in Brooklyn tied to a tree. Thankfully some kind folks found him and took him to BARC Shelter where he got care before his adoption. So happy he found his forever home! We’ll bark to that! !